The new match ball for the 2006 FIFA World Cup™ was officially unveiled last week during the final draw for the competition. The new adidas +Teamgeist™ introduces a radically new 14-panel configuration reducing the amount of three-panel touch points by 60 percent and the total length of the panel lines by over 15 percent, forming a smooth and perfectly round exterior allowing players significant improvements in accuracy and control. The new adidas +Teamgeist™ match ball, which was tested at Loughborough University. The match ball is designed in white and black, the traditional colors of the German national football team, and accentuated with the golden color of the FIFA World Cup™ trophy. Its name, ‘+Teamgeist’, is based on the single most decisive characteristic every team needs to have in order to lift the trophy - team spirit! Only balls with a perfectly round and smooth surface react reliably and consistently when kicked. Key to the unmatched performance of the new match ball is the revolutionary 14-panel ball construction. This innovative configuration brings down the number of three-panel touch points by 60 percent (from 60 to 24) and the total length of the panel lines is reduced by over 15 percent (from 400.5cm to 339.3cm). The Thermal Bonding technology, which adidas successfully introduced in 2004, has been further refined to give the +Teamgeist™ performance qualities found in no other ball. Extensive comparative testing by Loughborough University and in the adidas football laboratory in Scheinfeld, Germany, provide proof that the overall performance of the +Teamgeist™ is unprecedented. The new adidas +Teamgeist is widely expected to beat all known sales records and is globally available in retail now. The experience of adidas in football production is unequalled. adidas first began the production of footballs in 1963 and is now the world’s leading manufacturer, always at the cutting edge of technology. adidas has supplied the official Match Balls to all major UEFA and FIFA tournaments since 1970 and will also be the official partner and supplier of the Match Ball of the 2010 and 2014 FIFA World Cup™. adidas will continue to apply innovative technologies to further expand its leadership in the worldwide football market. This will solidify adidas’ position as the authentic symbol of high-performance equipment for both professional and amateur players alike. 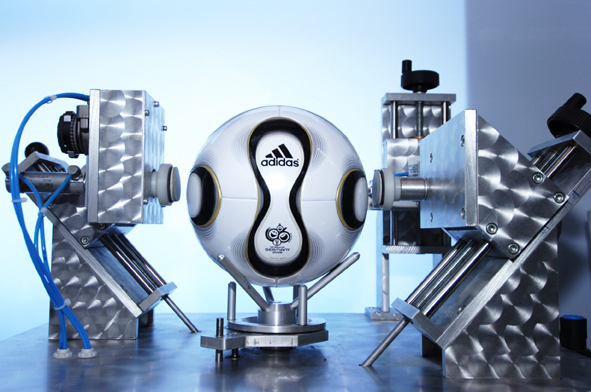 Moreover, adidas also already looks forward to presenting revolutionary ball innovations for the 2010 FIFA World Cup™ in South Africa. Loughborough has an established reputation for excellence in teaching and research, strong links with industry, and unrivalled sporting achievement. Assessments of teaching quality by the Quality Assurance Agency place Loughborough in the top flight of UK universities. The National Student Survey ranked Loughborough equal first among full-time students, and industry highlights the University in its top five for graduate recruitment. Around 40% of Loughborough's income is for research, and 60% for teaching. The University has been awarded five Queen's Anniversary Prizes: for its collaboration with aerospace and automotive companies such as BAE Systems, Ford and Rolls Royce; for its work in developing countries; for pioneering research in optical engineering; for its world-leading role in sports research, education and development; and for its outstanding work in evaluating and helping to develop social policy-related programmes.